Publisher: Berkley Sensation, published by the Penguin Random House Company, New York, N.Y.
Whoa a change in time period does make a difference in a story! I’ve never read a paranormal romance that takes place in the 1920’s and Bitter Spirits was a great introduction to the world of bootleggers, black magic and the spirit world. Winter Magnusson needs help fast, he’s had a curse placed on him that basically makes him a shining beacon to ghosts everywhere. Not exactly productive or safe for a bootlegger. In order to be free of haunting ghosts, Winter goes in search of a medium to remove the curse and gets more than he bargained for when he meets Aida. Aida Palmer makes her living as a medium, “performing” as often as possible, but unlike many others who claim to be mediums, Aida truly can summon and expel the dead. She’s a tough character with a special gift and I liked her a lot. She wasn’t a whiner or complainer and she never expects any one to rescue her, nor does she hope for a prince charming and a happily ever after. Which is great but it also complicates her relationship with Winter. Winter and Aida’s relationship is a complicated one. Each of them has had a difficult life and circumstances have forced them to be solitary people, which they’ve become accustomed to. So when they suddenly find themselves having to work with and in some ways depend on another person, they get unusually stubborn and pigheaded. Throw in the fact that they’re attracted to one another and that just throws them both in the middle of “unknown” territory. Through their ups and downs Winter and Aida manage to find a method that works for them while trying to find out who cursed Winter in the first place, however, their romance isn’t such an easy fix. The twists and turns in Bitter Spirits made for some interesting moments, some were wholly expected and others had me saying “Wow, I didn’t see that one coming!” Either way, I couldn’t put the book down until Winter and Aida found all the answers they were looking for. I loved the easy to understand flow of Bitter Spirits. I’ve never read a 1920s romance and I was never really good in history so it was great that author Jenn Bennett was able to bring 1920s San Francisco to life in as much authentic detail and slang as possible without alienating readers like myself who aren’t familiar with the time period. The author also kept a brisk pace throughout the Bitter Spirits that kept the story from getting stale or dull. Secondary characters brought some variety to the story and hopefully will become main characters in their own books soon. Bitter Spirits is an enjoyable read whether you’re a fan of the 1920s or if, like me, you have very little knowledge of the popular time period. Aida Palmer is a spirit medium in the 1920s who performs onstage in shows, calling up ghosts for the living. Winter Magnusson is a notorious bootlegger more comfortable with guns and bootlegged whiskey than phantoms. But when Winter is hexed to attract the dead to him like glue, two people of two different worlds will meet to help him rid himself of his curse. 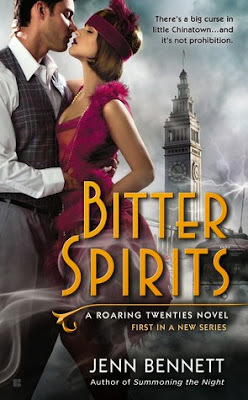 Set in the Roaring 20s—one of my favorite eras—the author obviously did her homework on the clothing, speakeasies and other parts of the time when writing this historical paranormal romance, beginning of a series. I even loved her descriptions of things from the era and even of places in San Francisco,, specifically Chinatown. I can see the characters walking or driving in the rain or nighttime, when the fog rolled in. The flavors of Chinatown come alive. I can see figures dressed in long coats and fedora hats. Other more feminine figures dressed in flapper dresses and with bobbed hair cross my imagination. Women in long, shimmering gowns stroll into rooms where jazz bands play. I could imagine real-life historical figures like Charlie Chaplin and Rudolf Valentino wandering into this book. Add the suspense that sets the mood, splash in the spookiness of magic and paranormal, add a dash of the red-hot passion of two lovers, and you got a jim dandy novel (to coin a phrase used back then.). Ms. Bennett has a winner in this novel. She already has wetted my appetite for the second one in the series, which I got a peek of at the end of the book. Pick up this novel and be prepared to take a Bonnie and Clyde wild ride. Just don’t forget your beads, Tommy guns, and flapper dress, and become addicted to another paranormal romance! 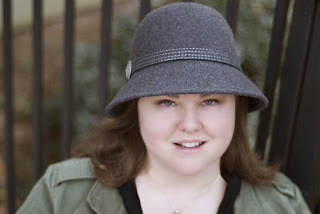 Jenn Bennett is the author of the Arcadia Bell urban fantasy series from Pocket Books and the Roaring Twenties historical paranormal romance series from Berkley. Born in Germany, she’s lived and traveled extensively throughout Europe, the U.S., and the Far East. She currently lives near Atlanta with one husband and two very bad pugs. Great reviews. Sounds like an interesting book. Great reviews ladies! I was lucky enough to read the ARC a few months ago, and was blown away by this book. I've had my eye on this book waiting for it to come out. Looking forward to when it comes out.